So, to most people, November is a time to give thanks. For the year behind. The holidays ahead. For all of the good things in our lives. And I like that sentiment. I have a lot to be grateful for. I do. But...I'm not going to lie. This has been a bit of a roller coaster of a year. I've read more self help books lately than any one person should, and one of my favorite authors - Melody Beattie - advocates being thankful for both the good and the bad things in your life. The good, well, because they're good! And the bad, because...they exist and the longer you try to pretend they aren't there, the longer these "bad" things can control your life. Make sense? Some people struggle with being "thankful" for the bad things in their lives. But I say it is what it is. To me, it's like an episode of Oprah I watched years and year and years ago. Ms. O. basically said that the longer you hold onto bad feelings, thoughts, etc., the longer you'll be controlled by them. You need to forgive people, situations, etc. and move on. If you can talk about the bad things in your life, you can basically say, "well, hello bad thing in my life! I see you! you're not the boss of me anymore." Oprah says, "Forgiveness is giving up the hope that the past could have been any different." So my next month of blogging is going to be focused on the good, the bad, and the ugly in my life, and probably a couple recipes and restaurant reviews thrown in. If there's one thing that helps me get through bad times, it's writing. (I've gone through a one subject notebook diary this month alone) And I hope that you can either relate to the things I'm talking about or chuckle at how neurotic I am. P.S. 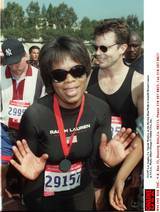 Random factoid - when I ran my first marathon, my only goal - besides not dying - was to beat Oprah's time. Her time was 4:29:15. I beat her by 17 seconds.